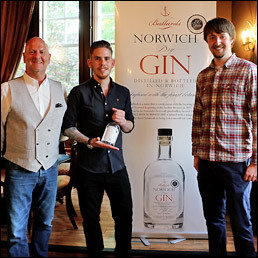 Norwich has just seen the release of its very first London Dry Gin with the official launch of Bullards Norwich Dry Gin on Thursday May 12, 2016. Featuring the South American Tonka bean as one of the predominant botanicals, Bullards gin has been distilled so that it is smooth and balanced enough to be drunk neat without a mixer or a premium tonic. The gin is the brainchild of Patrick Fisher, owner of the Redwell Brewery, Russell Evans, co-owner of the historic Bullards brand, Craig Allison, former manager of the Gin Palace in Norwich, and distiller Peter Smith. Created to be the perfect gin with or without a mixer, it is 42.5% and combines a total of 10 botanicals to result in a complex, spicy-sweetness with strong juniper elements. 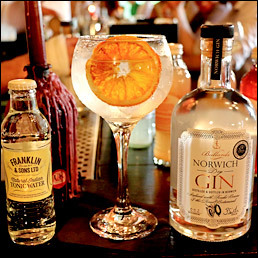 The distillery is built into the Ten Bells pub near Norwich city centre and first started producing gin in small 120L batches in December. Having just run out of Batch 002, the company will soon be starting work on Batch 003. Bullards gin can currently be purchased online at http://www.jarrold.co.uk/, or from various sellers around Norwich including Harper Wells, Bijou Bottles and Reno Wine. It can also be purchased on site at the distillery. Other spirits and experiments will be produced in the future.